In this issue of BlackFriars, you’ll read about Dominican Friars bringing God in word and sacrament to souls in secular institutions – colleges and hospitals – that are considered elite by the world’s standards. Sitting at a table in his prison cell, the Apostle ponders the words he is about to write in the epistle that lies before him. 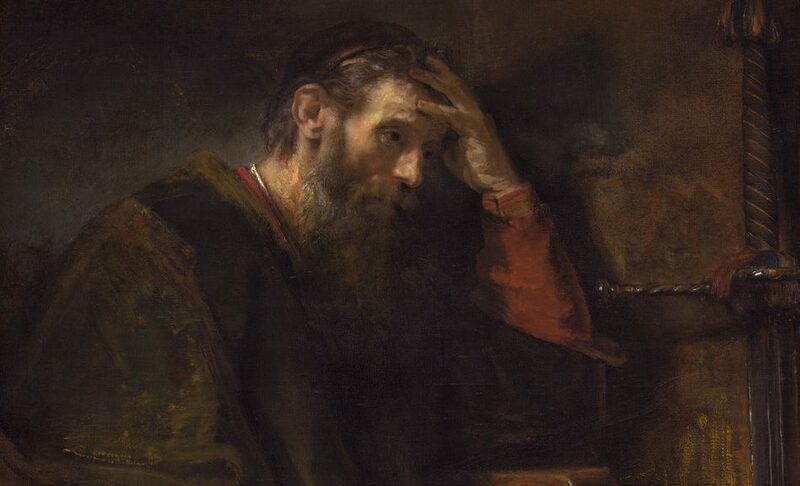 The solemn expression of Paul’s strong features underscores the depth of his belief and sense of purpose in his mission of rescuing humanity from the dominion of sin. The sword visible above the book is as much the “sword of the Spirit,” the term he used to describe the living word of God in his letter to the Ephesians, as it is the symbol of his military prowess as a soldier for Christ. Paul viewed the cross of Christ, as an inverted sword. Throughout his life he cherished taking up Christ’s sword of sorrow which he kept close to him like a promised prize of victory. It is no wonder that St. Dominic always carried Paul’s epistles slung at his belt. In this manner he constantly stocked the arsenal of his mind with the arms of the spirit in preparation for the next conflict, and reenergized his soul by intimate contact with God. The Dominican Friars continue to live out Dominic’s call to action bolstered by contemplation, preparing to preach the Gospel convincingly by stocking our minds with the best “spiritual weapons”: the sound philosophy of our elder brother St. Thomas, the teachings of the Church’s magisterium, and the truths of science and the other branches of knowledge. In this issue of BlackFriars, you’ll read about Dominican Friars bringing God in word and sacrament to souls in secular institutions – colleges and hospitals – that are considered elite by the world’s standards. This is something we Dominicans are uniquely positioned to do – largely thanks to your generosity. Equipped for battle with the help of your support, we will not abandon souls to a world without God, but continue the fight and prevail in the spirit of St. Dominic.